Trout are found in some of the most wild, romantic and scenically diverse habitats on Earth, and fly fishers the world over share a unique camaraderie, something universally profound and sincere. 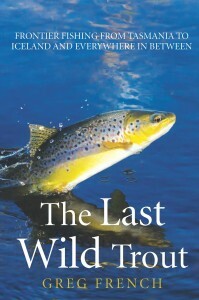 In The Last Wild Trout, Greg French explores the last truly great and most coveted trout fisheries left on the planet. Roaming the final frontiers of trout fishing, Greg visits twenty locations including Tasmania, New Zealand, Iceland, the British Isles, Mongolia, Slovenia, British Columbia, Wyoming, California, Nevada and Hokkaido. Each chapter deals with a unique species or subspecies of wild trout, and tells a compelling human narrative set against a backdrop of conservation. Photo sections and taxonomy notes complete the picture in this fascinating book. Reflecting on the complexity of humanity’s interactions with pristine natural environments and threatened fisheries, The Last Wild Trout is a reminder from one of the world’s best fishing writers of the beauty and importance of nature in all of our lives.